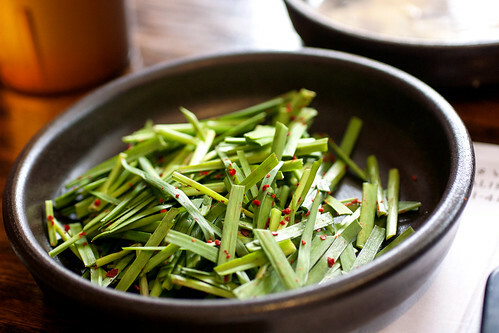 Like sullongtang (설렁탕, Korean ox bone soup)? I find it a bit boring. Yes, it’s restorative after one too many drinks, but boring nonetheless. DwejiGukbab (돼지국밥, pork bone soup with rice), on the other hand, is everything good about sullongtang, but magnified for maximum deliciousness. For $9.99, a great example of dwejigukubab can be found at To Soc Chon in Fort Lee. (Not related to the Tosokchon in Seoul.) 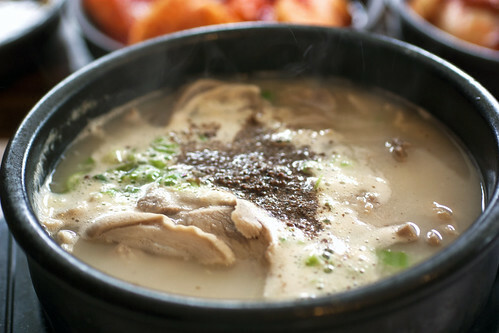 The soup is similarly creamy white as sullongtang, but cooked for hours with pork bones instead of beef, it’s more flavorful yet still clean tasting. As for the pork, it’s fresh and tender. 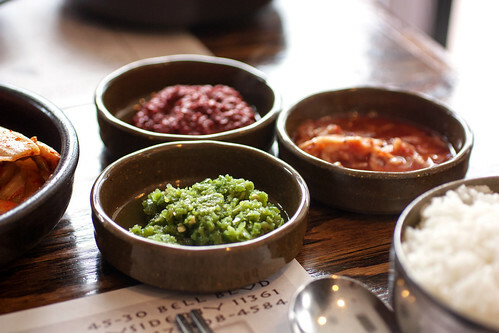 and your choice of condiments [fresh crushed green pepper, dry red pepper paste (다대기), and fermented, salted shrimp (새우젓)]. I like to mix in a bit of everything, and also dip the sliced pork into the salted shrimp. Nothing boring about that. If you haven’t had dwejigukbab and like sullongtang, it’s a must-try. Same restorative benefits, but with the added deliciousness of pork.